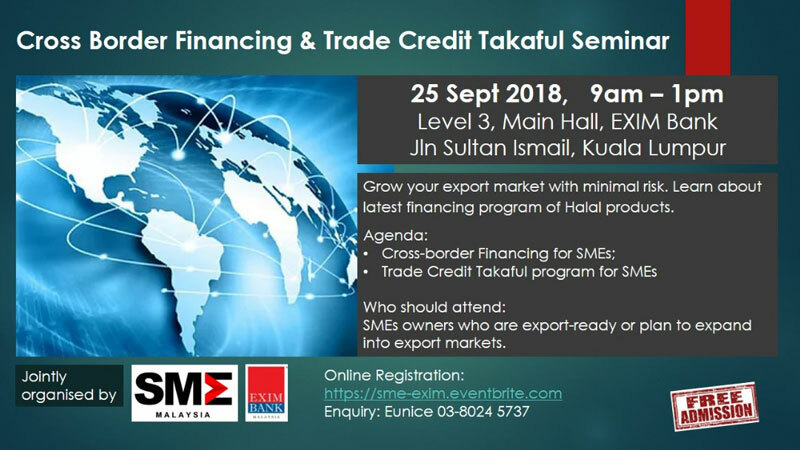 Please be informed that SME Association of Malaysia (SMEAM) in collaboration with Export-Import Bank of Malaysia Berhad (EXIM Bank) would like to invite you to participate in the Cross-Border Financing and Trade Credit Takaful Seminar on 25th September, 2018. 36, Jalan Sultan Ismail, Chow Kit, 50250 Kuala Lumpur. Grow your export market with minimal risk. Learn about latest financing program of Halal products. SMEs owners who are export-ready or plan to expand into export markets. For further information or registration, kindly visit our website: http://smeam.org or contact Eunice (03-8024 5737).